For those living and working in the Heber Valley during the late 1800’s, the Provo Canyon Toll Road was the only way to ship to market the hay, sheep, cattle, and dairy products produced by area ranchers. Likewise, it was the only way citizens in the community could travel to Provo and Salt Lake City to shop, purchase goods, or attend cultural, social, and religious activities.. Primitive by today’s standards, the road required a three day journey to traverse in good weather, and the trip could take longer in winter when snow slides often blocked the route. The thought of building a railroad into the valley was put forth as early as the 1850s, when Provo Canyon was surveyed as a possible route for the Transcontinental Railroad (an alternate path through Weber Canyon was eventually chosen). Also, the Utah Midland Railroad, which was to have been a subsidiary of the mighty Colorado Midland, had included Heber in its expansion plans, but like many early railroad schemes this one was never built. Undaunted, the citizens of Heber city pushed to have a railroad built into their community, and in the spring of 1896 the Denver & Rio Grande Western Railway (reorganized in 1899 as the Rio Grand Western) began surveying a route through Provo Canyon over the objections of the Telluride Power Transmission Company, which had plans to build an 85-foot high dam and reservoir within the canyon to feed its new power plant. Several court trials followed, but the case was eventually won by Rio Grande Western. As a result, a railroad would soon link Heber to the world. Track gangs went to work grading the line up Provo Canyon on March 20, 1899 as soon as the winter snows had melted to a point that they could clear-cut the right-of-way. The first lengths of 52-pound rail (surplus from the old D&RGWR main line) were spiked down a little more than one month later on April 24th. Much of the construction was done under the auspices of the Utah Eastern Railway, a subsidiary company of the Rio Grande Western that had been established in 1897 to build from Heber north over Wolf Creek and Duchene Pass, with a branch line to Park City, then east into Colorado. This line, which would have connected to the Rio Grande Western branch line into Heber, was never constructed, and in its short lifetime the Utah Eastern’s only project was the financial bakcing for the construction of the RGW’s Provo Canyon Branch. Amid great fanfare the first Rio Grande Western train arrived in Heber on September 21, 1899. A traditional “last spike” ceremony was held at the brand new Heber depot, a one story wood erected on land donated by members of the community. With nearly the entire population of the Heber Valley in attendance, the Mayor of Heber, Abraham Hatch, and the Mayor of Provo, L.O. Taft, together drove the final spike to complete the railroad. Celebrations lasted throughout the weekend. 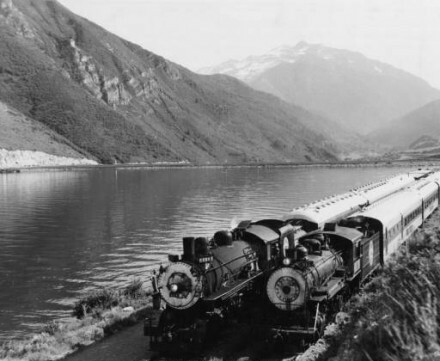 Regular train service between Provo and Heber was inaugurated in October 1899. Rio Grande Western trains that ran over the Provo Canyon Branch were established as mixed trains, that is they carried both passengers and freight cars together to save the expense of running two separate trains. The schedule called for Train #51 to leave Heber at 6:40 AM and arrive in Provo at 8:20 AM. After picking up and setting out cars there, it became Train #52, departing Provo at 9:30 AM and arriving back in Heber at 11:10 in the morning. A similar train, #53/54, worked the branch in the afternoon hours, departing Heber at 2:20 PM and returning at 8:05 PM. Several stops were made each way during the trip to replenish the locomotives water supply, which was used up quickly during the 27-mile run. The train was quickly dubbed the “Heber Creeper” by area residents. This raises a question that has been asked countless times over the years: why the “Heber Creeper” nickname? A brochure published in 1972 by the Wasatch Mountain Railway gave the following explanation: No one is certain just when the term “Heber Creeper” came into use, but the legend is that the narrow twisting canyon made the trip so slow people began to talk of the train just “creeping.” From “creeping” to the Heber Creeper was a logical step, and it is known by this name to this day. Passengers on the Heber line were often secondary to freight shipments, which consisted of lumber and building products, bulk fuel oil, milk, and coal. Three of the major shippers along the line were the Standard Oil Company, the Heber City Coal Company, and the Heber Valley Milk Depot. The shipment of agriculture products was also very important to the well-being of the Provo Canyon Branch. 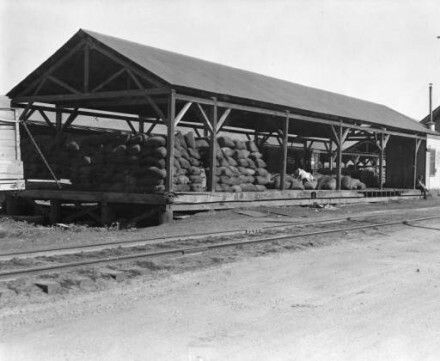 In 1915 the Rio Grande recorded that 60 cars of sugar beets, 40 cars of cattle, 280 carloads of hay, and 360 cars of sheep were shipped from the Heber depot. In fact, these records show that more sheep left the Heber station on a train than at any other railroad station in the United States during the 1920s and 1930s; at the time Heber was one of the largest sheep-producing regions in the world. Early photos of the yard show that the Rio Grande maintained large stock pens there, and also at Wallsburg, which allowed the sheep to be loaded quickly onto railway stock cars. In 1921 the Rio Grande Western and the Denver & Rio Grande merged to form the Denver & Rio Grande Western Railroad (D&RGW). It was during this period that automobiles began making inroads, despite the fact that area roads and highways were often poorly constructed. With more of the population driving, fewer passenger trains were needed, and in the 1920s trains #51-54 were eliminated, and a single second-class train, #308/307, was instituted. It left Provo at 7:00 AM and made a single round trip to Heber, returning to Provo at 11:05 AM. D&RGW Timetable No. 117 notes that this mixed train ran daily except Sundays, and that the maximum allowable speed was 20 mph. In the 1930s a paved highway, US-189, was built from Provo into Heber. This made traveling to Heber City by vehicle much easier, and farmers in the Heber Valley could now choose to ship their goods to market by truck, rather than by railroad. It was the beginning of the end for the railroad line. Major changes came to the Provo Canyon Branch in 1938. During that year the U.S. Army Corps of Engineers and the Bureau of Reclamation came to Heber City to build Deer Creek Dam, which created the waters of Deer Creek Reservoir. One of the obstacles to its construction was the D&RGW tracks, which ran right up the center of the valley, directly through the spot where the dam was to be located. For the next three years the Corps worked to move the railroad tracks from the valley floor to a ledge on the west side of the valley to an area that would be untouched by the waters of the lake. Heading up the project was Ellis L. Armstrong, a young construction engineer fresh out of college. The new railroad alignment that was built to bypass the dam and reservoir branched off of the original line between milepost 16 and 15 in Provo Canyon. A new right-of-way was surveyed and graded up the west side of Week’s Bench to a location on the west side of the Heber Valley, and a construction camp was set up along the original 1899 right-of-way at the approximate location where the dam is today. Crews working on the project were hosed in shacks owned by the Hoover family – area land owners. Not surprising, considering the task at hand, it took all of 1938 and 1939 to build the new rail line. Two new bridges were required in the Heber Valley itself; one across the Provo River and another over Snake Creek. Then there was the considerable amount of time it took to cut, grade, and lay down track on the new alignment. In 1940 trains started using the “new line” into Heber and the “old line” was torn up and salvaged. During its construction, and for a time after its completion, the “new line” was used by the construction company to move the materials needed to build the dam itself. Over a two year period, D&RGW trains hauled hundreds of tons of ill material from the Week’s Bench quarry site (at today’s milepost 11.5) to the construction site. The dam and reservoir were completed in 1942. With the relocation project finished, freight traffic on the branch increased somewhat during World War II, but after the end of the war in 1945 both freight and passenger revenues dropped off again as more and more people chose to use US Highway 189 rather than the railroad. By 1947, the mixed train’s coach was only being attached to the “Heber Local” if there were passengers to ride in it – and more often than not there weren’t any. By the mide-1960s freight traffic had all but disappeared; milk and cream from the Heber Valley Milk Depot was not longer shipped over the rails in bulk, and there was less of a demand in town for items such as oil and coal, as area houses had been converted to natural gas furnaces and electric lighting. Cattle and sheep – once the lifeblood of the branch line were now being moved out of the Heber Valley by truck. The largest shipper left was a lumberyard in Heber City owned by a local businessman named Lowe Ashton, which sat on the D&RGW-owned land next to the Heber depot. By the mid-1960s the Rio Grande was running trains less frequently to Heber – every other day at first, and then only once a week by 1966. There was not enough traffic to justify keeping the line open, and by 1967 the train was making the run to Heber only a few times per month. So quietly, the Denver & Rio Grande Western began formulating plans to close down the Provo Canyon Branch. Showing a net loss from continued operation of the line, the D&RGW filed to abandon the branch. The abandonment was approved by the ICC, and the last Rio Grande freight train rolled out of the Heber city depot and into the pages of history in 1968. The rails fell silent; rust and weeks covered the tracks, and local famers, thinking they would never see another train, built fences across the rails in several places. But it was not to the end of the railroad. After the D&RGW deserted the line the tracks were purchased by the Utah Department of Transportation; the rails were to be taken up and right-of-way used for relocating US-189 from the east side of the valley to the west side. But local residents were determined to preserver this slice of Utah railroad history. In 1970, thanks to the efforts of local citizens and area train enthusiasts, the historic rail line was saved from destruction. A new railroad, led by Lowe Ashton and other Heber City businessmen, along with members of the Promontory Chapter, National Railway Historical Society, was established in order to run steam train tours from Heber City to Bridal Veil Falls. It was knows as the Wasatch Mountain Railway. For motive power the group rescued Union Pacific 2-8-0 No. 618 from its longtime display site at the Salt Lake City fairgrounds, and purchased several other antique engines and cars from as far away as California and Washington State. The privately-owned Wasatch Mountain Railway operated from 1971-1990, sometimes under different names but always as the “Heber Creeper.” Unfortunately, despite an attempt by the State of Utah to purchase the railroad, it went out of business in 1990. Nearly all of its locomotives and passenger cars (save for steam locomotive No. 618 and a small Davenport diesel – that was still owned by the Promontory Chapter) were sold off to the Nevada State Railroad Museum in 1992. It appeared once again that the railroad, by then a local landmark, would be scrapped. But just as it had in 1970, the community came to the rescue of the historic rail line. In 1992 the Utah state legislature created a state agency: the Heber Valley Historic Railroad Authority, to operate the train and appropriated $1 million to find and purchase the appropriate locomotives and cars needed to operate the railroad, and refurbish the tracks which had fallen into disrepair. Over the next year the railroad slowly came to life again under the direction of Ken McConnell. Three surplus passenger cars were found in North Carolina; a diesel locomotive was found at Hill Air Force Base in Clearfield, Utah, and an old caboose in Salt Lake City. They were refurbished, along with former Union Pacific diesel locomotive D.S. 1011, which was owned by the Utah State Parks Department. The revived train, now christened the Heber Valley Historic Railroad, made its debut run on May 8, 1993. Since that day there have been many changes and improvements at the railroad. The tracks were completely rebuilt from Heber City all the way to Vivian Park between 1993 and 1994. A new two-stall locomotive shop was erected in 1994, and a new depot in 2001. Steam locomotives No. 618, which was in poor condition when it was acquired by the Heber Valley Railroad in 1992, was thoroughly overhauled between 1994 and 1995 (it is undergoing overhaul again in 2008). A larger, more powerful diesel locomotive was acquired in 1996 (the No. 1813? ), and a complete train set – the “Movie Train,” consisting of steam locomotive No. 75 and several passenger coaches and freight cars, was obtained in 1999. The railroad is operated much like the typical short line railways that could be seen in many parts of the Utah and all over rural America during the “Golden Years” of U.S. railroading, approximately 1920-1950. As such, the Heber Valley Railroad attempts to preserve a slice of Americana that has otherwise disappeared. The train ride and atmosphere of the railroad equipment, yard, and building will hopefully recall a bygone era. For many passengers this will be the first time they have ridden a train. For others, a ride aboard the Heber Valley’s coal-heated coach cars and antique cabooses will bring back pleasant memories of days long ago.